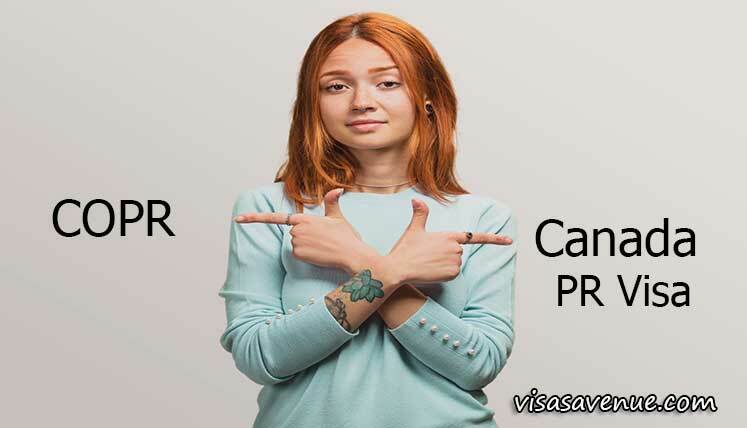 What is Difference between COPR and Canada PR Visa? The aspirants of Canadian permanent residency often look to collect as much as the information they can in order to apply with pinpoint accuracy. Although, Canada has been quite lenient on the Immigration process and immigrants, however, the frequently changing immigration rules and procedures often confuse the applicants also. Hence, if you are applying PR in Canada, you must obtain as much as information you can well in advance. Moreover, if you take services from a genuine and registered Canadian Visa Consultant, most of your headache of confirming process details will get reduced. Difference between COPR and Canada PR is one among the key queries of the applicants. Let’s find out the details to clear all the confusion in this regard. Well, first of all, both these are not the same. One of these documents or status you get upon reaching Canada, while the other you get in your home country only. Canadian PR is the status you get when you are physically present in Canada and known as a ‘Landed Immigrant’.This is the final stage of your Canadian PR application process when you actually get the PR Status upon landing in Canada. You cannot get Canadian permanent residency status without being physically present in Canada. What is a Canadian PR status? The Canadian PR status allows you to live, work or study in any part of Canada. Also, you get social benefits, health coverage, etc. However, it comes with some restrictions. As long as you stay in Canada for 2 years in every 5-years period, you can sustain your Canadian PR status. In case you don’t fulfil this minimum stay requirement, your PR status expires. The Confirmation of Permanent Residence (COPR) is basically your one-time entry visa. This is not permanent residency allocated to you by the Canadian government or Immigration Refugees and Citizenship Canada (IRCC). Once you land in Canada using the single entry visa, you receive your permanent residency. However, in case, you do not enter Canada within visa date (first entry date on your PR visa stamp), your application expires and you will not get Canada PR and hence, lose your Canadian visa status. In this case, you need to reapply to get the status back. If you did not enter Canada before the first entry date on your PR visa stamp, then you have lost your Canadian visa status. You need to reapply again to get the status back. If registering online profile (in Express Entry or PNP etc. program) is the first step of your Canadian PR process, then Landing in the maple leaf country is the final step of obtaining the Canadian PR application process. Hope, now you must have understood the difference of Confirmation of Permanent Residence (COPR) and Permanent Resident Visa. Need assistance to apply PR in Canada? In case, you need further advice, assistance or complete support to apply and obtain permanent residency in Canada, you may get in touch with Visas Avenue Immigration- the top and trusted Visa Consultancy for Canada Immigration and PR Process. You may call Visas Avenue migration experts on Toll-Free Number- 78-18-000-777. Moreover, to get your eligibility checked and subsequently, receive a call from the expert, you may fill the free assessment form.